Not just for runners, foot pain is incredibly common, and – unsurprisingly – pretty complex. There is a lot going on down there! 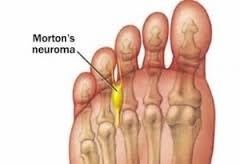 Morton’s Neuroma – Morton’s neuroma is a painful condition in the ball of the foot, most commonly between the 3rd and 4th toe. It is caused by a thickening of the soft tissue around one of the nerves which leads your toes. Often described as feeling as if you are standing on a sharp object, other symptoms include sharp, burning pain in the ball of your foot, or a stinging, burning or numbness in the toes. Metatarsalgia – essentially “painful metatarsal”, this is very similar to Morton’s Neuroma, with pain in the ball of the foot the primary symptom. Metatarsalgia is thought to be caused by various different conditions affecting the foot, and so is a symptom, rather than a condition, as it were. Stress Fracture – the curse of English Footballers! A stress fracture is a small crack in a bone, or sometimes severe bruising within a bone, most commonly the 2nd or 3rd metatarsal (long thin bones of foot). Most stress fractures are caused by overuse, or high impact activity – “Insanity” training, for example. Symptoms include pain that starts and increases during normal activity; pain that decreases at rest; pain on palpation (touch). There will sometimes be associated swelling or bruising. Bunions – Also known as hallux valgus, bunions are a deformity of the big toe, where the big toe angles towards the second toe causing a bony lump on the side of the foot. This can lead to a large sac of fluid forming – known as a bursa – which can then become inflamed and painful. There are various causes, however it is thought to hereditary, so choose your parents carefully! Gout – Gout affects around 1 in 40 people, and is a type of arthritis where swelling and pain develops in joints, primarily the base of the big toe. The joint will start to ache, then swell up and become red (sometimes ‘shiny’), hot and very painful. A temperature and fatigue are also common with gout. Gout is caused when crystals build up and form around the body’s joints, causing inflammation and pain. These crystals are a result of the body not ridding itself of enough of a product called urate – more detail can be found here. Plantar Fasciitis – a commonly treated foot problem that affects a variety of people. Although plantar fasciitis is a common problem, little scientific evidence exists concerning the most appropriate intervention. So what it is exactly? Well, anything with ‘itis’ on the end means ‘inflammation’, and the plantar fascia is a thick band of connective tissue that runs the length of our feet, from your heel to your toes. So inflammation of the sole of the foot! However – as is the inconsistent nature of PF – this isnt always the case with the condition! See previous blog for full information. This entry was posted in Uncategorized on 30th September 2016 by DCInjuryClinic.